First step : you need to Preheat the oven to 350 degrees. Second step : Coat a small baking dish with cooking spray. Peel & dice the sweet potatoes into bite size cubes & place in the baking dish. Melt butter in the microwave & pour over the potatoes along with the olive oil, brown sugar, cinnamon, nutmeg, ginger & salt. Add more sugar or cinnamon if desired. Toss to coat evenly. Bake in the oven for 60 mins. 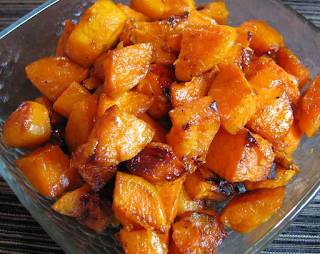 Stir the sweet potatoes once or twice during roasting. Enjoy.